I pushed my cart over to the dairy section and grabbed my milk and then crossed the aisle over to the eggs. I looked at the price-per-unit price for the dozen vs. the 18-pack and noticed (once again) that the price is essentially the same. Then a small display to my right caught my eye. 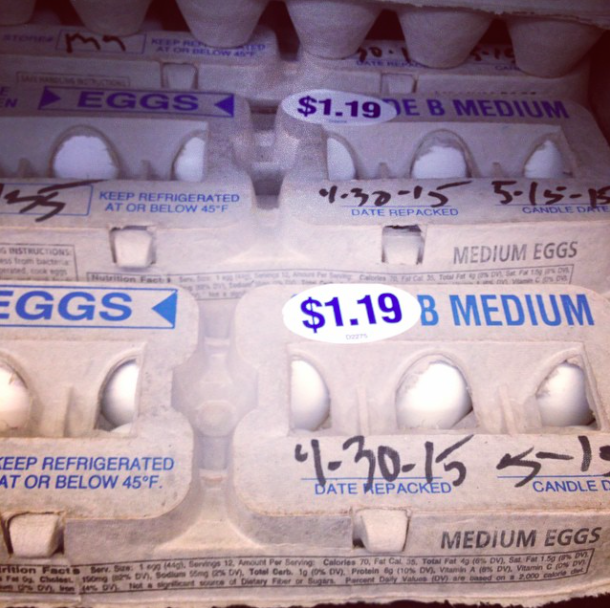 A hodgepodge shelf of eggs that were marked as “repackaged,” as well as being discounted. Most grocery stores throw away cartons of eggs if there’s anything wrong with even a single egg, so I was mightily pleased to discover that my grocery store is working to avoid food waste. Especially since this single 99¢ carton was lurking in the back. Do you see that half the eggs are brown? Which means they’re likely from a free-range/organic pack. I bought two dozen eggs, which saved me a dollar. A dollar which is now available to be spend in a more meaningful manner. Like sending my sons to college. Save on the small things, and your money will be available for the big things in life. Good for you! I wish some of our grocery stores would do things like this. Occasionally, we will be able to get milk on sale, which is great. Once, Publix even had their organic milk half price, and OMG was it soooo good. So lovely that your store is avoiding waste by doing this. Kudos to them! It’s the first I’ve seen of it, and I’m hoping they continue with it. I’ll try and find an employee to ask more about it next time I go. Our local Trader Joe’s doesn’t repackage eggs, but they do at least send the remaining eggs to the food bank. Not sure if this is company-wide, but it’s a great policy. Just a thought, but you might want to drop an email to the manager of that store telling him that you really approve of the practice and you’re telling everyone you know. Gives real meaning to the term ‘egg money’! You didn’t ask what we’re doing to save in this post, I’m going to tell you anyway! We’re in rental housing with most of our stuff unpackedor in storage. Hasn’t stopped us from inviting family for dinner! Got the menu in mind, but, the big crock pot, footed cake plate, punch bowl…are all unpacked, location unknown! That’s ok, I’ll simply adjust the menu to work with what I’ve got…smaller crock pot AND crock pot buffet server, colored glass platters and plain white platters, muffin pan instead of Bundt pan, pitcher for drinks, white table cloth instead of yellow, everyday cloth napkins instead of themed napkins or paper! The food will be mostly from scratch and the company will add all the festivity we need. We’ve lived away from family for so many years, that just the chance to get together is such a treat. Making the best of a good situation! Today’s frugal idea: shop for super-cheap like-new baby clothes and send them to ThredUP to see if I can double my money. Kind of a gamble, but I used to do it all the time when we had a children’s consignment shop in town and made a nice little nest egg. I’ll let you know how I do…. I’ve been known to do it with really nice super cheap books, too, to turn in to the used book store for store credit. I haven’t paid cash for a book there in years…. and I often buy cheap jewelry to take aparto make into new pieces for my Etsy shop. In the process today, I found an entire set of toddler rhythm instruments for 50 cents!! Something I’ve been meaning to buy, to help my granddaughter with speech therapy, at waaaay ess than they usually cost! I also treated myself to a BK lunch, using a free sandwich coupon I got for taking a survey. And last but not least, picked up some more books, DVDs and audiobooks from the library, to keep me busy next week. I love our library!! Our Safeway store will mark down meat, eggs, and milk near their expiration date. I always check for those when I am in there. I shop there all the time. Our local Safeway has three different discount areas (there may be more, but that’s what I’ve found) One for meat, one for frozen, and one for shelf stuff. The shelf one is all a jumble with seasonal, groceries & drugstore stuff. A store near my dad’s house had a section for unpleasant-looking produce. Oh man did I snap that one up. A grocery store near us (Sniders) often cuts off icky parts of vegetables and sells the resultant bit as preprepared. For example, if they buy cauliflower and it develops “age spots” (don’t know what to call those) they’ll trim them off and cut the florets off the stem. Then they’ll sell the florets in a tray, at a price which is slightly higher (but not outrageous) than the full things. After Thanksgiving they donate all of their unsold pumpkins to the zoo. The elephants love the pumpkins. At home in Massachusetts, brown eggs are always cheaper and more plentiful. Someone had a slogan that went, “brown eggs are local eggs and local eggs are fresh!” Now I still find it weird that the cheap eggs here in Seattle are white! White eggs used to be a luxury reserved for Easter egg dying. I know that brown eggs aren’t necessarily synonymous with free range/organic, but for some reason they’re only sold here when they are. Weird, right? Egg color is mainly determined by the breed of chicken. 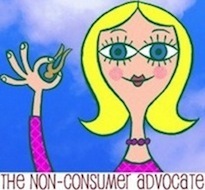 I totally remember that slogan. I may still sign it as I walk past the eggs in the grocery store! Brown eggs are not always organic, it is the color of the hen.. city people think that brown are better.. so they cost more! 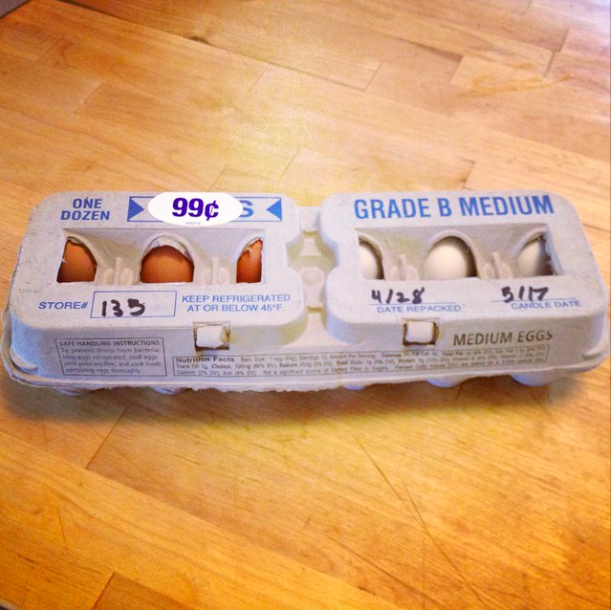 Our grocery used to always carry Grade B eggs..I don’t really know what made them get a B instead of an A but they were MUCH cheaper.I have to ASK for them, and often they “make up” a pack in the back for me.. ??? Now,I live in a very small town and the Grade B eggs are not available in our 2 grocery stores.There are a lot of people up here who have chickens and sell organic fresh eggs for $3.00 a dozen. Over all, we are eating much LESS eggs since we have made some dietary changes but $3.00 a doz. is steep when you are on a retirement budget. And these were “medium,” but they seem just as big as the “large” I usually buy. I remember my first mother-in-law, who’d spend time picking out the smallest egg from the carton of a dozen she’d bought. We never could convince her that she could just buy smaller eggs. Madeline, you got me wondering about egg grades and this is what I found. Grade AA – eggs have whites that are thick and firm; yolks that are high, round, and practically free from defects; and clean, unbroken shells. Grade A – eggs have characteristics of Grade AA eggs except that the whites are “reasonably” firm. Grade B – eggs have whites that may be thinner and yolks that may be wider and flatter than eggs of higher grades. The shells must be unbroken, but may show slight stains. This grade is usually used to make liquid, frozen, and dried egg products. Either that or if you know someone with chickens could you trade them for something you have/ do? For example- Maybe you can help them with a creative sign and that payment works out to be a dozen eggs every other week for a year? I have a freind with chickens and I watch her daughter one evening a week (for all of two hours) and she pays me in eggs and homemade pickles. Please forgive me if you have answered this before but, when you mention that the money you save is going to your son’s college fund, do you have a saving account set up where you deposit the dollar you just saved on eggs? Do you keep a tally and transfer funds at a scheduled time? Or do you just know that each purchase adds up and paying for college won’t hurt as much in the future? At this point it’s a physical envelope as my oldest son is in college! What a good idea. I wish my supermarket did that. I bought eggs at 1/3rd of the price this week because the expiry date was a week away. With egg sandwiches for lunches one day and zuchini slice the next I could have bought more and used them before the date. My boy is a long distance runner and eggs are good fuel for him. For next time, the expiration date on eggs is a freshness date, and is too conservative. Eggs can be used long after their expiration date. Thanks Katy. I do tend to get sucked into the whole expiry date and stick to it. Growing up we had chickens and we dated the eggs with the date they were layed. I do remember checking if the egg sunk or floated if I was ever in doubt. I need to go back to that common sense wisdom. A lot of things are that way. A best if used by date/ or sell by date is very different then an expiration date. Milk is an essential part of my mornings, too. I got in the habit of keeping canned milk in the pantry, for those mornings when we run out and I can’t get to the store. It doesn’t taste exactly the same as fresh, but if you add flavorings or use it in your coffee, you can’t tell. When Fred Meyer’s has 1\2 gallons of milk for .99. I’ve started buying extra, and freezing them. My SIL got me started doing that. I am the only one in the house that drinks milk, so a half gallon lasts me awhile. The only downside is it takes 4 or 5 days to thaw, and must be shook alot. So you have to think ahead. I love haunting the discounted food at my local supermarket! Today there was nothing appealing in the canned or baked goods sections, but I scored some marked down bananas and apples in the discount produce section. And the bananas aren’t even overripe, they’re just right! We’ll eat them in the next day or two, for sure. After my credit for the glass milk bottle I returned, I left the store with four bananas, three apples, and a half gallon of organic grapefruit juice and spent just $4.34. Yay! I volunteer at a free breakfast program and they get the eggs that have one or more broken eggs in the carton. I love that they do not throw them out. Whether they sell them at a discount or donate them to the food programs, at least they are not being wasted. I went to BiLo Tuesday to use a rain check and coupon for bacon. While there, I saw several reduced meat packages so I stocked up on some beef that had been $9.00, sale priced to $7.00, with a reduce by $3.00 coupon making them $4.00 each. Woo-Hoo!! I used the beef in a stir-fry so that it went even further. Usually I look for meat in the $.99 cent/ pound range but that is getting harder to come by. I often find eggs for $.99/dozen (not organic) at Walgreens. When I do, I try to stock up. It seems they always have a lot of them because no one tends to buy eggs at a drug store. I have been using all these savings to pay for my son’s college, too, and he graduates next Saturday!!! We are finding it hard to believe we made it through the four years and look forward to our “raise” when we no longer have to pay tuition or save for college (which we have done for 21 years). We do need to do some major house repairs and start saving for replacement vehicles but I doubt we will change many of our frugal ways even though we can. Keep up the good work, Katy, and you will reach this milestone one day, too!!! It comes along sooner than you ever think it will. I’m all about the college savings too–my older son is starting in the fall, and I just learned that our family contribution piece is paid in July and January–sooner than I thought. Setting up a 10-month payment plan costs almost $100 nonrefundable dollars :(. I’m trying to stick to $100 weekly for food and household budget (family of 4). It caused a little hunger panic yesterday as we had been pretty efficient at clearing out reserves (those teenagers eat a lot!). But 2 weeks in, this is looking doable. Congratulations Patti!! You must be so proud of your son. It’s good to hear about coming out the other side of this tuition tunnel! Google dumpster dive on You tube! What a great idea to prevent waste! I wish my local market would do that but I don’t fully trust them as sometimes it appears they repackage chickens and I would swear it’s so they can try to extend the sell-by date. I’ve had several nasty bouts of food poisoning in the past that sent me to an ER, (not from food I bought from them though), so I am very cautious about what I eat. But if they labeled stuff like your store did then I would feel a bit safer making that choice. Katy, just curious – to be more frugal would you ever train yourself to drink your tea without milk? I learned to drink black coffee years ago because it was just easier to do so – I didn’t want to have to worry about not having milk or added sugar. (I also felt it was more mature – I was young…) Now I love it that way!